In 2011 Diana was appointed Visiting Professor in Occupational Health at London South Bank University (LSBU) and returned last week to receive the Honorary Fellowship title at the university's graduation ceremony at the Royal Festival Hall. With a career spanning over 50 years, Diana is one of the country's leading authorities on occupational health. An academic, barrister, author and government adviser, Diana has had a long and eclectic career and yet is showing no signs of slowing down anytime soon. Diana graduated from King's College London in 1959 with a first-class degree in law. She went on to write her master's thesis on comparative law after winning a Fulbright Scholarship enabling her to study at Tulane University, New Orleans. Upon arriving back in the UK, Diana took up what was billed as a temporary job as a lecturer in the Faculty of Law at Manchester University, where she is still an honorary senior lecturer in the department of Occupational and Environmental Health today. Diana's main focus is disability discrimination and occupational health. She used this passion as an opportunity to begin writing her first text 'Occupational Health Law' in 1989. Known as the Bible for anyone involved in occupational health, it is now in its fifth edition, with a sixth on the way. Although she had qualified as a barrister several years before, she did not go into practice until the age of 50. "I was the oldest pupil on the Northern Circuit," Diana says. "I remember going into court one day and realising that not only had I taught the QC on the other side, I'd taught the judge too." Within a few years, Diana had been appointed a part-time judge in employment tribunals, a post she held for 17 years. At the same time, she continued to teach part-time, while her growing expertise and influence led to increasing demand for her services as an adviser at the highest level. Diana has been a member of a number of government committees, including the Expert Advisory Group on AIDS and the Industrial Injuries Advisory Council, and has also been appointed MBE for services to occupational health. She is currently Chair of the UK Council for Work and Health representing all the professions involved in the provision of occupational health services. As well as continuing to publish books and journal articles, Diana is also in demand for training of occupational health professionals, safety advisers and human resources professionals in employment law. Over the years, Diana has helped to run a range of charities. She currently is a director of a not-for-profit company, Syngentis, and is also a trustee of the Manchester Settlement, a charity which provides a range of services to the community in a deprived part of east Manchester, and a governor of Manchester High School for Girls. 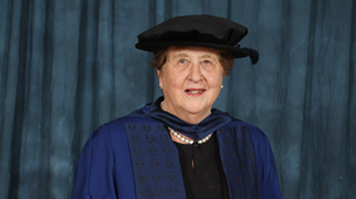 Upon receiving her award, Diana commented: "I am honoured to be recognised for my work by London South Bank University, an institution recognised for its dedication to providing opportunity to the less privileged in our society and for supporting new initiatives in education, especially in the field of health care." LSBU Vice Chancellor Professor David Phoenix added: "Throughout her career, Diane has shown her desire and passion to share her knowledge of such a key subject area to others and is continuing to do so. We are delighted to present Professor Diana Kloss MBE the award of this Honorary Fellowship in recognition of her outstanding contribution to occupational health law."